"The grass withers and the flowers fade, but the word of our God stands forever" (Isaiah 40:8, NLT). We are assured that the words God has spoken and caused to be bound together in the volume we call the Bible will never cease to exist. That is not true, however, of a single printed volume of Scripture. Paper-and-ink Bibles can undergo some pretty serious abuse in their service to us. In college, I carried my Bible everywhere I went. At first I had the thick teen devotional Bible I had used all through junior high and high school, but I soon set it aside in favor of a much slimmer volume that didn't take up as much space or weigh as much. I hadn't owned it very long when disaster struck. The reusable water bottle I also carried everywhere I went had the lid screwed on crookedly and when I tossed it in my backpack with everything else, it slowly leaked until the entire contents of my bag were soaked through! I was so upset that my nice new Bible was all warped afterwards! 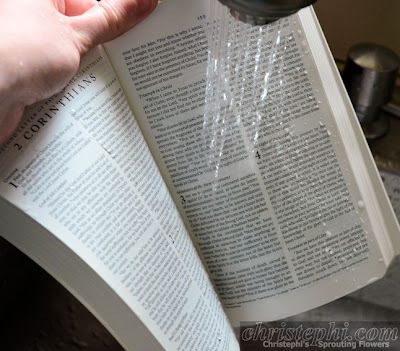 I sure could have used a Waterproof Bible! Growing up in the city, Bobby Bardin didn't have much experience in the outdoors until middle school when he began backpacking with some guys from his church. He spent a lot of time in high school and college backpacking, whitewater kayaking, rock climbing, etc. But one thing that hardly ever made it with him on his trips was a Bible. He didn't want to risk ruining the thin paper pages when he was in the great outdoors. His friend Michael Marsee had similar experiences. As an on-mountain chaplain for a Christian camp, he would see Bibles get ruined in just 10-15 minutes of mountain-top worship. These two friends got together and decided to produce a Bible that would withstand the rugged environments they enjoyed so much. Now they have a Bible that can go where they go without fuss or worry! It is available in five popular versions. Each version is available as a full Bible for $44.95 or as a New Testament with Psalms and Proverbs for $24.95. With three different cover options: pink & brown floral, blue wave, and sportsman camouflage. It can be purchased directly from the publisher or from your local Christian bookseller (find one here). "The WATERPROOF BIBLE© is printed on 100% plastic. This material is both waterproof and tear-resistant with normal use. This material is adversely affected by temperatures above 150° F. If the WATERPROOF BIBLE© freezes while wet, thaw before opening. This durable format can be dried with a towel or by standing it on its spine with the pages up. 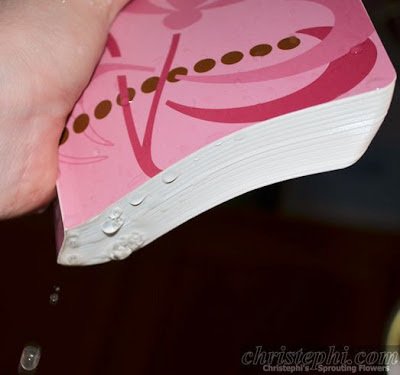 Water will cause the pages to adhere to one another, but once dry, they will return to their original condition. Petroleum products can cause the ink of the WATERPROOF BIBLE© to smear, so keep it away from all such products, including bug spray." What better than a rainy spring day and a puddle full of sticky Missouri mud to put my Waterproof Bible to the test? Or how about a warm bubbly bath with Miss M? After the mud puddle I gave it a quick rinse in the sink; the mud vanished without a trace! I squeezed water out of the binding and set it on the counter to dry. The pages were all stuck together, but in less than 24 hours it had dried completely and I was able to fan through the pages like normal. It was as good as new! Impressive! It really is waterproof! No weakening of pages or binding while wet. No warping of pages upon drying. 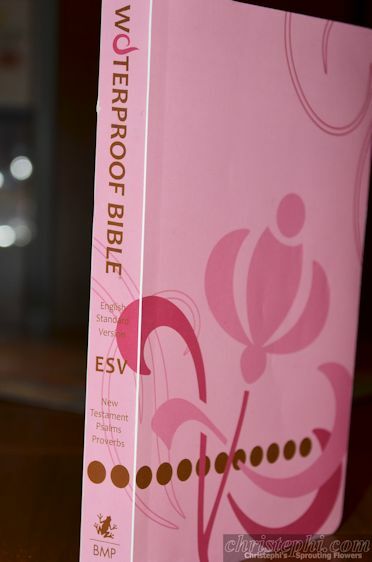 The pages are slightly thicker than the traditional tissue-thin paper used in Bibles. These wouldn't be ripped by a single, solitary swipe from your infant or toddler (c'mon, Moms, you know what I'm talking about)! I also tested the ability to write and highlight on its plastic pages. I was most skeptical about this, but true to the claims, I was able to write with ball-point pen, pencil, and dry highlighter. The pen and pencil markings survived the dunking, but the dry highlighter was completely washed away. Now as much as I love the great outdoors, I'm not much into rugged outdoorsman type activities. We go camping now and then as a family, but nothing too wild and crazy. 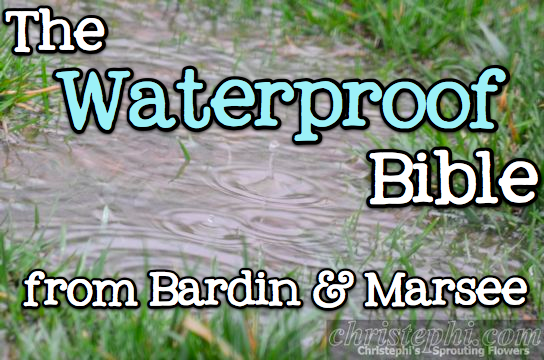 But that doesn't mean I don't have a bunch of scenarios in which I could use a waterproof Bible! This would make a fantastic graduation present! Or a gift for a new mom. Or a send-off gift for new missionaries (especially those going to tropical climes). Reading material for a lifeguard. Really, the possibilities are endless! I wish it were available in the New American Standard Bible (NASB) version since that is my version of choice. If it were, I'd buy one and make it my main Bible. The print is so crisp and clear! Because the pages are thicker than an average Bible, there's not as much bleed-through of text from the pages behind where you're reading. I understand some people like to carry just a copy of the New Testament, but I'm not one of them. I've been using the ESV New Testament (with Psalms and Proverbs) that I was given for this review and I miss being able to reference passages in the Old Testament! I love, love, love the concept! 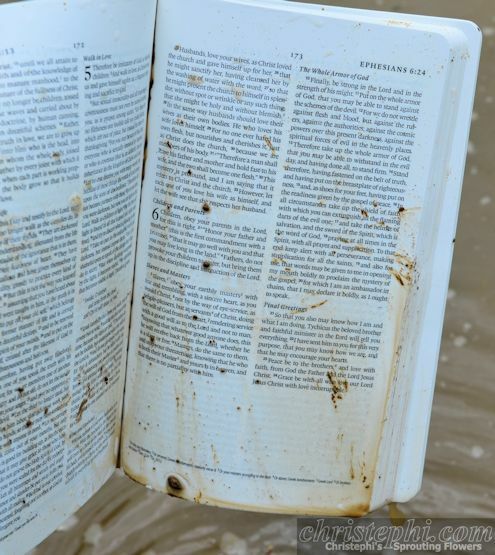 And I think everyone should have a Waterproof Bible! 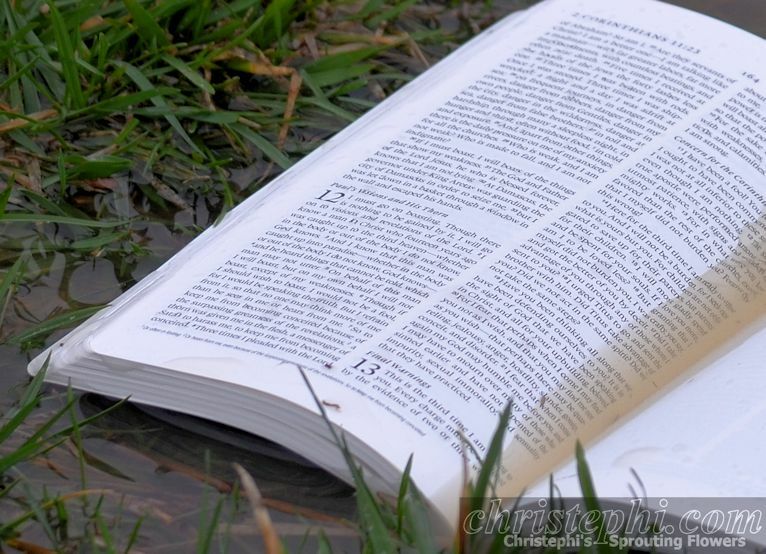 How wonderful to have a Bible that is as durable as you yourself! Where you go, it can go too. Great review!! The mud and bubbles didn't slow it down!! Awesome job on your review!! I loved your pictures! !